Self talk can be one of our worst obstacles in life. 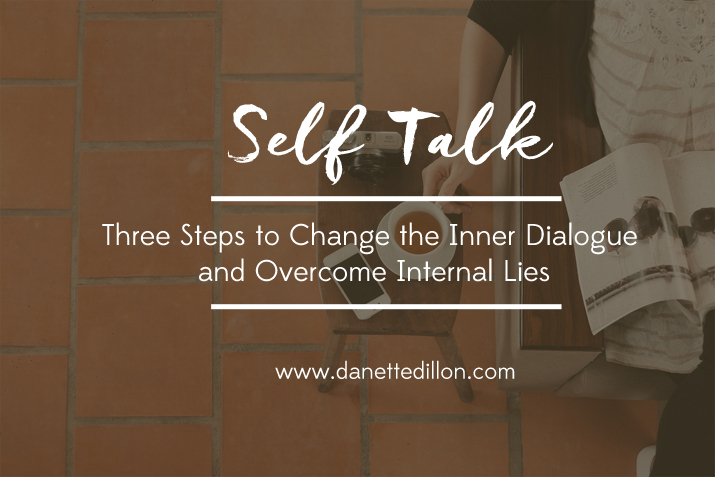 Self talk are those conversations that happen in our head and those voices that never seem to shut up. Those voices just go on and on and on. Those voices scream the words of our past experiences and every fear we've ever had straight in our face. And we can't run from them either. They're inside of us comparing who we actually are with what other people say or have said we are. They contradict what we know is true about ourselves by telling us lies. The really crazy part is we are the voice who's lying and comparing and contradicting reality! Sometimes we just have to tell ourselves to shut up. Not literally, of course, but those inside voices--the negative self talk that runs around in our head. Tell that voice to shut up. And then, after you've stopped listening to all those lies, replace those lies with truth. The truth is you're are going to make it. It doesn't matter how far you've fallen or messed up, you can get up and start again. The truth is you can do anything for at least a little while. And if you can do anything for a little while you can do it for as long as it takes. Have you seen that episode of the Unbreakable Kimmy Schmidt? You know, the one where she says, "I can do anything ten seconds....You can handle anything for ten seconds." but it's still true. If you can make it ten seconds then there's a good chance that you can make it for twenty. And thirty. And forty. And as long as you need to. Don't give up on yourself. The truth is you're not alone. No matter how alone you feel there is always someone right there with you. In Deuteronomy 3:16, through Moses, God is confirming to the Jewish nation that He will go with them into the land (Israel) that He promised them. He said this, "Be strong and courageous. Do not fear or be in dread of them, for it is the Lord your God who goes with you. He will not leave you or forsake you." So, you're going to make it. You can do anything for as long as you have to. You are not alone. But somehow that negative self talk still comes through. How do we get that inner lair to shut up? 1. Replace the negative thought with a truth. Our thoughts don't change themselves. We have to purposely change them. Whenever you have a negative thought stop yourself from saying it and immediately speak out loud a truthful statement. It's important to say it out loud because we need to replace all the negative things we've heard about ourselves. Eventually, we'll start to believe the truth instead of the lie. 2. Ask for some accountability. As much as I wish she would, my sister, Dalayna, will not let me throw myself a pity party. As much as I would like to, she makes me get out of my head and see life as it really is. Sometimes she does get it wrong, but even when her correction is off, her insight does change my perspective. And I need that more than I need almost anything. Now, in my sister's case, I never asked her to hold me accountable. She just does that because that's what sisters do. Maybe you don't have a sister who can challenge you to believe the truth. Ask someone else who is positive and has some wisdom. One word of caution. When you ask for accountability, don't get upset when it's given to you. You asked for it. 3. Do the positive things you know you should do even when you don't feel like doing them. We run our lives by our feelings. And too often, because we run our life by how we feel, we ending up ruining our lives. It doesn't have to be this way. If you change your thought processes and if you change your language and if you surround yourself with positive influences eventually your positive forward motion will start. But in the meantime, you might have to act on what you know in your head and not how you feel in your heart. The war we wage within ourselves is always worse that battle we face in the real world. It's a battle between who we are and who we want to be and our own fear and self doubt. Yes, self talk is a challenge but you can do this. You can do anything for at least a little while. You're not alone. Now, go win this fight.